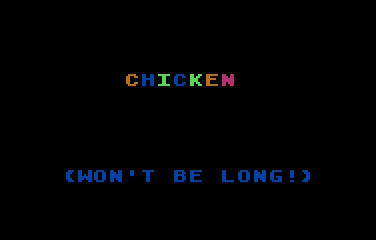 Chicken is a smooth “Frogger”-type game that originally appeared in the first issue of Antic. This BASIC program works on all 8-bit Atari computers of any memory size, with disk or cassette. We’re proud that so many readers have been with us for the entire five years of Antic Magazine’s publication. However, most people discovered Atari computers and Antic considerably more recently. Now you won’t miss out on the classic programs from Antic’s early years. Our newest department — the Antic Hall of Fame — will reprint outstanding programs from the issues we published five years ago. — and also to ensure that typing them is made as easy as possible. It’s a pleasure to begin the Hall of Fame with Stan Ockers’ Chicken from April 1982, the very first issue of Antic. 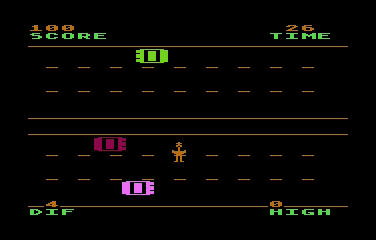 Though now less active than he used to be, Ockers is probably the best known and most prolific programmer of Atari public domain games. He still lives in Lockport, Illinois, but his games usually premiere in the newsletter of the Eugene (Oregon) ACE. He has resisted offers to turn pro and gives all his games to public domain, refusing to accept payment for them. Ockers’ smooth, inventive games are state-of-the-art Atari BASIC and highlighted this magazine’s early issues. His last appearance in Antic was Crickets, September 1985. Other public domain programmers have tinkered with the original Chicken listing. So unfortunately many current versions do not work correctly on the XL/XE computers. However, the listing published in this issue is the “pure” version that Ockers recently sent us at our request, and it works just fine on the XL and XE. Actually, our chicken is trying to score points by getting safely across this busy highway. Each time he makes it adds to his score, but the cars go faster and faster. If he gets hit, the SPCA sends an ambulance and the cops slow the traffic for a while.